In the past few months the Reputaction team has worked a lot on software development in parallel to business development. After being close to release the first Minimum Viable Product (MVP) based on a Web application with cloud-based storage, the next step is to store information on a public blockchain to reach an unprecedented level of transparency regarding trustworthy product information including supply-chain, workers, buyers, sellers and reviews information. Related competitors, such as TripAdvisor, are known to forbid access to its reviews information, only sharing some information through a closed Application Programming Interface (API) to few external partners. Worse, TripAdvisor reviews are known to be flawed because no verification of the customer experience is done. For example, a number of fake restaurants have succeeded to be ranked first on TripAdvisor in the recent years. In order to increase transparency and trustworthiness, Reputaction relational value product information will be stored publicly on a blockchain. We have worked on defining which blockchain seems to be the most appropriate for this task. Below we first discuss how the most promising decentralized application (dApp) platforms compare. Then, we explain our current roadmap for the Reputaction dApp implementation. A MVP means that it is a first version of a product with the minimal number of features. Usually, it is also part of an agile development approach meaning that the goal is to release the MVP as soon as possible. If the dApp platform requires a lengthy learning-curve by the available developers, then releasing soon cannot be done. Another usual requirement of a MVP is that it shouldn't be too costly to build and run. The attack-resistance, transaction speed and decentralization aspects don't need to be stronger than what the current market expects, especially if the MVP doesn't have to use the blockchain for too sensitive or fast operations and storage. Later on, if other features must be added to the MVP along with more resources and time, it may still be possible to port it to another dApp platform. 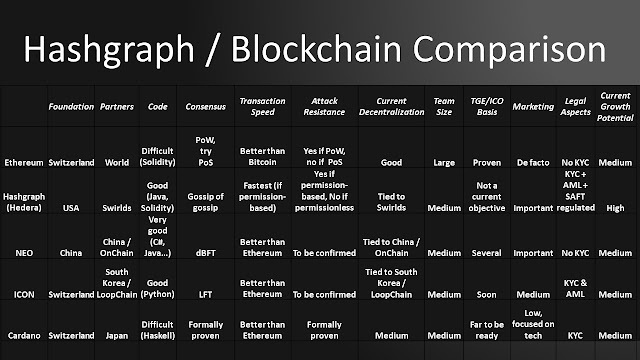 Based on the above comparison between Ethereum, NEO, Cardano, ICON and Hashgraph (Hedera), NEO seems to provide the best dApp platform for a MVP. First, the learning-curve is short because it is integrated in the well-known .NET development platform. Second, although the cost of initial deployment may be high for some project, the fact that operations and storage below 10 GAS are free may be interesting for projects that rely on many small operations and storage. Third, attack-resistance, transaction speed and decentralization aspects may not be perfect but they are currently accepted by a good number of stakeholders and are sufficient for MVP without sensitive operations and speed requirements. It is the reason that Reputaction, which has no high-speed requirement, is currently developing its MVP with NEO. We are still in good discussion with ICON for further developments, especially because all its tokens are linked to token holders who passed KYC/AML, which is important from a long term legal point of view. So far, Ethereum hasn't been considered further, mainly due to its difficult programming language, associated learning curve and long-term cost of each operation and storage. In addition to this blog, you can follow us on Reputaction Instagram, Reputaction Twitter, Reputaction Telegram, Reputaction Reddit and Reputaction YouTube.